CALGARY, Nov. 6, 2018 /CNW/ - Surge Energy Inc. ("Surge" or the "Company") (TSX: SGY) announces its operating and financial results for the quarter ended September 30, 2018. 1 This is a non-GAAP financial measure which is defined in the Non-GAAP Financial Measures section of this document. 2 The Company views this change calculation as not meaningful, or "nm". 3 See the Additional Metrics section of this document for further information. In accordance with industry practice, the Company uses adjusted funds flow to analyze the cash flow generated from its ongoing principal business activities. On this basis, both adjusted funds flow and cash flow from operating activities are provided for comparative purposes. Please see the Non-GAAP Financial Measures section of this release for further details. Based on continued successful development of Surge's Sparky, Valhalla, and Shaunavon core areas, the Company's Q3/18 production rate averaged 18,029 boepd. 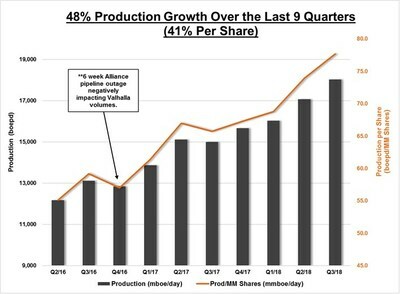 The Company's Q3/18 production exceeded Surge's previously released 2018 production exit rate guidance of 17,175 boepd by five percent, and exceeded analyst consensus production estimates of 16,880 boepd4 for Q3/18 by seven percent. Over the last nine financial quarters Surge has now grown the Company's production per share by 41 percent. As a result of this consistent production per share growth, combined with higher oil prices, Surge's adjusted funds flow per share in Q3/18 increased by 80 percent as compared to Q3/17, and cash flow from operating activities per share increased by 45 percent as compared to Q3/17. Surge's continued quarterly operational outperformance has been accomplished to date within the Company's existing capital expenditure budget guidance of $107 million for 2018. The Company's previously announced $320 million, accretive, light oil acquisition (the "Acquisition") of an Alberta based, private oil company named Mount Bastion Oil and Gas Corp. ("Mount Bastion" or "MBOG"), closed on October 25, 2018, and provided no operational or financial contribution to Surge's Q3/18 results below. Surge's Q3/18 quarterly average production of 18,029 boepd (79 percent oil and liquids) increased by more than 20 percent over Q3/17 production of 15,007 boepd (18 percent per share), and increased by six percent as compared to Q2/18 production of 17,072 boepd (five percent per share). At Betty Lake, the Company drilled four wells to follow up Surge's discovery well drilled in Q4/17. All four of these wells were successful, and production from the pool is now greater than 600 boepd (83 percent oil). Cash flow from operating activities in Q3/18 was $37.2 million ($0.16 per share), an increase of more than 50 percent as compared to Q3/17 at $24.6 million ($0.11 per share). Adjusted funds flow in Q3/18 was $40.6 million ($0.18 per share), an increase of 77 percent as compared to Q3/17 at $23 million ($0.10 per share). The Company's operating netback per boe increased by 40 percent, to $28.75 per boe in Q3/18, from $20.59 per boe in Q3/17. The Company had an all-in payout ratio6 of 85 percent in Q3/18, while maintaining a net debt7 to adjusted funds flow ratio6 of 1.74 times. The Company's revolving credit facility increased by 57 percent to $550 million, up from $350 million previously. The Company estimates $150 million in undrawn capacity at October 25, 2018. 4 Consensus average production of 16,880 boepd as per Thomson Reuters as at October 23rd, 2018. 5 This is a capital management measure which is defined in the Capital Management Measures section of this document. Surge's consistent production per share growth, combined with higher crude oil prices, is driving significant increases in the Company's adjusted funds flow and cash flow from operating activities per share. Surge's strong Q3/18 results were achieved with WCS differentials for the quarter averaging approximately 15 percent wider than Q2/18. 6 This is a capital management measure which is defined in the Capital Management Measures section of this document. 7 This is a non-GAAP financial measure which is defined in the Non-GAAP Financial Measures section of this document. Pursuant to the Company's press release dated October 25, 2018, Surge announced the Closing of the MBOG Acquisition. The Acquisition includes 5,500 boepd (98 percent liquids) of operated, light oil production in the Greater Sawn Area and has a base annual production decline of 21 percent. The combination of Surge and MBOG results in a 22,500 boepd (85 percent oil-weighted), light and medium gravity, intermediate, growth and dividend paying company. Surge spent a total of $28.7 million of exploration and development capital in the third quarter of 2018 for the drilling of 12 gross (11.8 net) wells, along with waterflood injector conversions, associated infrastructure, land and seismic. In the Sparky core area, Surge drilled six gross (5.8 net) wells. At Betty Lake, the Company drilled four wells to follow up the discovery well drilled in Q4/17. All four of the Betty Lake drills were successful and production from the pool is now greater than 600 boepd (83 percent oil). The Company now estimates more than 50 net follow-up locations8 (five net booked) at Betty Lake. Surge also drilled two successful Sparky oil wells at Eyehill in the quarter, and converted two additional wells to water injection. At Valhalla, Surge successfully drilled and completed one gross (one net) Doig well. Over half of this well was positioned less than 200m from the nearest offset. The initial pressure for the well was 95 percent of the original pressure, which exceeded management's expectations, and further validates the Company's ongoing downspacing program. Surge also successfully drilled five (five net) wells at its Shaunavon core area in Q3/18, targeting both the Upper and Lower Shaunavon formations. These five successful wells are producing a combined rate of more than 500 boepd. The Company also continued its ongoing pumpjack conversion program. To date, 38 wells have been converted from progressive cavity pumps to pumpjacks, for a total combined production add of over 550 boepd net to Surge at a cost of less than $10,000 per flowing boepd. Despite the recent widening of Canadian oil differentials, approximately 33 percent of the Company's estimated fourth quarter oil production is either located downstream of recent apportionment points or trucked to sales points unaffected by apportionment. Notwithstanding this, Surge expects its average realized crude oil price in the fourth quarter to be lower compared to the third quarter, based on realized prices to date and current forward pricing. Following the acquisition of the MBOG assets, the Company plans to drill two incremental light oil wells at Sawn, as well as undertake infrastructure modifications and 3D seismic acquisitions. Accordingly, budgeted capital expenditures for 2018 have now been increased from $107 million to $117 million. Surge anticipates the additional Sawn wells will come on production in early January 2019. Management's stated goal is to be the best positioned, top performing, light/medium gravity crude oil growth and dividend paying public company in our peer group, in Canada. increased Surge's dividend three times by a cumulative 33 percent, while maintaining a dividend payout ratio9 of under 20 percent. During the extremely volatile period from the announcement of the Acquisition on September 5th, 2018 until today: 1) US$ WTI prices have fallen from a high of US $76.24 to as low as US $62.17 per barrel; 2) the Canadian oil industry has experienced an unprecedented widening of Edmonton to WTI light oil differentials, which have increased from US$10/bbl to as high as US$41/bbl; and 3) Canadian WCS crude oil differentials to WTI have widened dramatically, from US$24.50/bbl to as high as $46/bbl. On this basis, given Surge's disciplined approach to the dividend policy, the Company's Board of Directors and management will be analyzing whether to defer some portion or all of the previously anticipated dividend increase from $0.10 per share to $0.125 per share, based on market conditions. Surge's next dividend payment announcement is November 15, 2018. The Company continues to focus on sustainability, balance sheet management, and cost controls to deliver returns to Surge shareholders. The Company continues to grow its production base and 11 year drilling inventory in its existing Sparky, Shaunavon, and Valhalla core areas - through low risk development drilling results, waterfloods, and strategic, high quality, large OOIP10, core area acquisitions. The Acquisition of the MBOG assets brings a fourth core area to further expand the Company's light oil development drilling and waterflood inventory. Surge anticipates confirming 2019 guidance in early January, 2019. 9 This is a capital management measure which is defined in the Capital Management Measures section of this document. 10 Original Oil in Place (OOIP) is the equivalent to Discovered Petroleum Initially In Place (DPIIP) for the purpose of this press release. More particularly, this press release contains statements concerning: the impact of the Acquisition on Surge and its results and development plans; Surge's dividend payout ratio and all-in payout ratio; anticipated 2018 exit rate production; management's expectations with respect to the development of the Sawn asset and the timing thereof; Surge's declared focus and primary goals; Surge's annual exploration and development capital expenditure program and budget; anticipated Q4 realized crude oil prices; commodity prices; availability of undrawn capacity with respect to Surge's credit facility; management's continued evaluation of the repurchase of Surge shares under the existing NCIB; management's plans to confirm 2019 and the timing thereof; Surge's dividend policy and the expectations of management with respect to an increase to Surge's dividend; and the timing of release of 2019 guidance. Information respecting Surge's 2019 forecast operating netback and forecast cash flow from operating activities set forth in this press release may be considered to be future-oriented financial information or a financial outlook for the purposes of applicable Canadian securities laws. Financial outlook and future-oriented financial information and projected operational information contained in this press release are based on assumptions about future events based on management's assessment of the relevant information currently available that management considers to be reasonable in the circumstances. The future-oriented financial information and financial outlooks and projected operational information contained in this press release have been approved by management as of the date of this press release. Readers are cautioned that any such future-oriented financial information, financial outlooks and projected operational information contained herein should not be used for purposes other than those for which it is disclosed herein. The forward-looking statements are based on certain key expectations and assumptions made by Surge, including expectations and assumptions concerning the ability of Surge to execute and realize on the anticipated benefits of the Acquisition; the performance of existing wells and success obtained in drilling new wells; anticipated expenses, cash flow and capital expenditures; the application of regulatory and royalty regimes; prevailing commodity prices and economic conditions; development and completion activities; the performance of new wells; the successful implementation of waterflood programs; the availability of and performance of facilities and pipelines; the geological characteristics of Surge's properties; the geological characteristics of the MBOG Assets; the successful application of drilling, completion and seismic technology; the determination of decommissioning liabilities; prevailing weather conditions; exchange rates; licensing requirements; the impact of completed facilities on operating costs; the ability of Surge to increase its dividend post-closing; the availability and costs of capital, labour and services; and the creditworthiness of industry partners. Boe means barrel of oil equivalent on the basis of 1 boe to 6,000 cubic feet of natural gas. Boe may be misleading, particularly if used in isolation. A boe conversion ratio of 1 boe for 6,000 cubic feet of natural gas is based on an energy equivalency conversion method primarily applicable at the burner tip and does not represent a value equivalency at the wellhead. Boe/d and boepd means barrel of oil equivalent per day. Original Oil in Place ("OOIP") is the equivalent to Discovered Petroleum Initially In Place ("DPIIP") for the purposes of this press release. DPIIP is defined as quantity of hydrocarbons that are estimated to be in place within a known accumulation. There is no certainty that it will be commercially viable to produce any portion of the resources. A recovery project cannot be defined for this volume of DPIIP at this time, and as such it cannot be further sub-categorized. Bbl means barrel of oil. NGLs means natural gas liquids. This press release discloses drilling locations in two categories: (i) booked locations; and (ii) unbooked locations. Booked locations are proved locations and probable locations derived from an internal evaluation using standard practices as prescribed in the Canadian Oil and Gas Evaluations Handbook and account for drilling locations that have associated proved and/or probable reserves, as applicable. Booked locations referenced in this press release account for all of Surge's Asset Acquisitions and Divestiture activity up to and including the date of the subject acquisition, reflecting the bookings that existed (from the respective 3rd party auditor), as of January 1, 2018. Booked locations referenced for Mount Bastion corporate acquisition are based upon Sproule's reserve report titled "Evaluation of the P&NG Reserves of Mount Bastion Oil & Gas Corp. (as of December 31, 2017) for Surge Energy Inc. using Surge Energy Inc.'s Development Plan", dated August 31, 2018; this sensitivity run removed 73 gross (54.0 net) economic locations from Sproule's original 2017 year end reserves, leaving 67 gross (60.7 net) economic locations booked as of December 31, 2017. Unbooked locations are internal estimates based on prospective acreage and assumptions as to the number of wells that can be drilled per section based on industry practice and internal review. Unbooked locations do not have attributed reserves or resources. Unbooked locations have been identified by Surge's internal certified Engineers and Geologists (who are also Qualified Reserve Evaluators) as an estimation of our multi-year drilling activities based on evaluation of applicable geologic, seismic, engineering, production and reserves information. There is no certainty that the Company will drill all unbooked drilling locations and if drilled there is no certainty that such locations will result in additional oil and gas reserves, resources or production. The drilling locations on which the Company actually drills wells will ultimately depend upon the availability of capital, regulatory approvals, seasonal restrictions, oil and natural gas prices, costs, actual drilling results, additional reservoir information that is obtained and other factors. While certain of the unbooked drilling locations have been de-risked by drilling existing wells in relative close proximity to such unbooked drilling locations, the majority of other unbooked drilling locations are farther away from existing wells where management has less information about the characteristics of the reservoir and therefore there is more uncertainty whether wells will be drilled in such locations and if drilled there is more uncertainty that such wells will result in additional oil and gas reserves, resources or production. Assuming the January 1, 2018 reference date outlined above, the >50 gross (>50 net) Sparky locations identified herein 4 gross (4 net) are Proved locations and 1 gross (1 net) are Probable locations. The Company adjusts cash flow from operating activities in calculating adjusted funds flow for changes in non-cash working capital, decommissioning expenditures, transaction and other costs, and cash settled stock-based compensation plans, particularly cash used to settle withholding obligations on stock-based compensation arrangements that are settled in shares. Management believes the timing of collection, payment or incurrence of these items involves a high degree of discretion and as such may not be useful for evaluating Surge's cash flows. Changes in non-cash working capital are a result of the timing of cash flows related to accounts receivable and accounts payable, which management believes reduces comparability between periods. Management views decommissioning expenditures predominately as a discretionary allocation of capital, with flexibility to determine the size and timing of decommissioning programs to achieve greater capital efficiencies and as such, costs may vary between periods. Transaction and other costs represent expenditures associated with acquisitions, which management believes do not reflect the ongoing cash flows of the business, and as such reduces comparability. Subsequent to the third quarter of 2018, all of the Company's stock-based compensation plans are equity classified as the Company has the intention of settling all awards with shares. Cash settled stock-based compensation currently represents the statutory tax withholdings required on stock-based compensation awards and is a discretionary allocation of capital. The Company has the option to either require the holder to sell shares earned in the stock-based compensation plan to satisfy tax withholdings, or the Company can issue less shares to the individual and remit a cash payment to satisfy tax withholding requirements. Each of these expenditures, due to their nature, are not considered principal business activities and vary between periods, which management believes reduces comparability. Adjusted funds flow per share is calculated using the same weighted average basic and diluted shares used in calculating income per share. There is no comparable measure in accordance with IFRS for net debt. Net debt is calculated as bank debt plus the liability component of the convertible debentures plus or minus working capital, however, excluding the fair value of financial contracts and other long term liabilities. This metric is used by management to analyze the level of debt in the Company including the impact of working capital, which varies with timing of settlement of these balances. Net operating expenses are determined by deducting processing and other revenue primarily generated by processing third party volumes at processing facilities where the Company has an ownership interest. It is common in the industry to earn third party processing revenue on facilities where the entity has a working interest in the infrastructure asset. Under IFRS this source of funds is required to be reported as revenue. However, the Company's principal business is not that of a midstream entity whose activities are dedicated to earning processing and other infrastructure payments. Where the Company has excess capacity at one of its facilities, it will look to process third party volumes as a means to reduce the cost of operating/owning the facility. As such, third party processing revenue is netted against operating costs in the MD&A. Additional information relating to non-GAAP measures can be found in the Company's most recent management's discussion and analysis MD&A, which may be accessed through the SEDAR website (www.sedar.com). Certain capital management measures in this press release – namely, "dividend payout ratio", "all-in payout ratio", "free adjusted funds flow", and "net debt to adjusted funds flow" are disclosed for the purpose of providing investors with additional insight as to how the Company evaluates the management of its capital. Management uses each of the capital management measures included in this document to analyze the Company's capital management objectives and to assist in capital allocation decisions. Management believes capital management measures may be useful to investors on the same basis. None of these measures are used to enhance the Company's reported financial performance or position. The capital management measures do not have a standardized meaning prescribed by IFRS or a corresponding IFRS measure and therefore are unlikely to be comparable to similar measures presented by other issuers. They are common in the reports of other companies but may differ by definition and application. The amounts used in the calculation of the measures are derived from the financial statements that are prepared in accordance with IFRS. In some instances, the capital management measure incorporates a non-GAAP measure, such as adjusted funds flow and net debt, which are defined in the non-GAAP section of this document. All-in payout ratio is calculated using the sum of total exploration and development capital plus dividends paid divided by adjusted funds flow. This capital management measure is used by management to analyze allocated capital in comparison to the cash being generated by the principal business activities. This measure is provided to allow readers to quantify the amount of adjusted funds flow that is being used to either: i) pay dividends; and ii) deployed into the Company's development and exploration program. A ratio of less than 100% indicates that a portion of the adjusted funds flow is being retained by the Company and can be used to fund items such as asset abandonment, repayment of debt, fund acquisitions or the costs related thereto, withholding tax obligations on stock based compensation or other items. Dividend payout ratio is calculated as the dividends paid for the respective period divided by adjusted funds flow. This capital management measure is used by management to analyze the level of dividends currently being paid on the stock in comparison to the cash being generated by the principal business activities. Net debt to adjusted funds flow ratio is calculated as net debt divided by adjusted funds flow for the period. This capital management measure provides an indication of leverage and the number of years it would take to repay the net debt based on the level of adjusted funds flow. Additional information relating to non-GAAP and capital management measures can be found in the Company's most recent management's discussion and analysis MD&A, which may be accessed through the SEDAR website (www.sedar.com). * Taken directly from the financial statements.